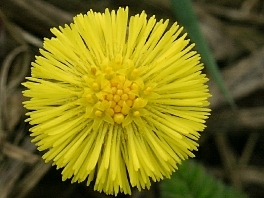 The Coltsfoot can grow on very poor soil, even on brown coal, where it is the only plant to grow. In early springtime it is one of the first flowers that blossoms. Often people mix up the yellow flowers of the Coltsfoot with Danelion but looking closer the flowers are quite different. The Coltsfoot flower grows on a stalk with scales and there are no leaves in the flowering time of the Coltsfoot. The soft leaves appear one month later, when the flowers finished blossoming. The leaves smell like mild balsam and are grey and feltlike at the bottom side. 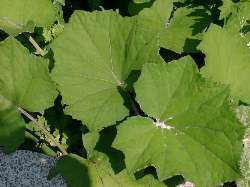 The main use of the Coltsfoot are problems of the breathing system. It can help against cough, bronchitis and asthma. Used externally Coltsfoot can also help against problems of the skin because it can stop inflammations, kills bacterias and stops bleeding.